For a custom that's become quite mundane to most of us, Daylight Saving Time (DST) has a fascinating history. And I'm not just saying that as a history nerd. It took 50 years of back-and-forth, will-they-or-won't-they legislation before the United States finally hooked up with DST for good. Even now, it's not fully embraced by the entire country. Among the most interesting questions regarding the adoption of the clock change is: who started Daylight Saving Time, anyway? There is no conclusive answer to this question, as more than one person has been credited with its invention. 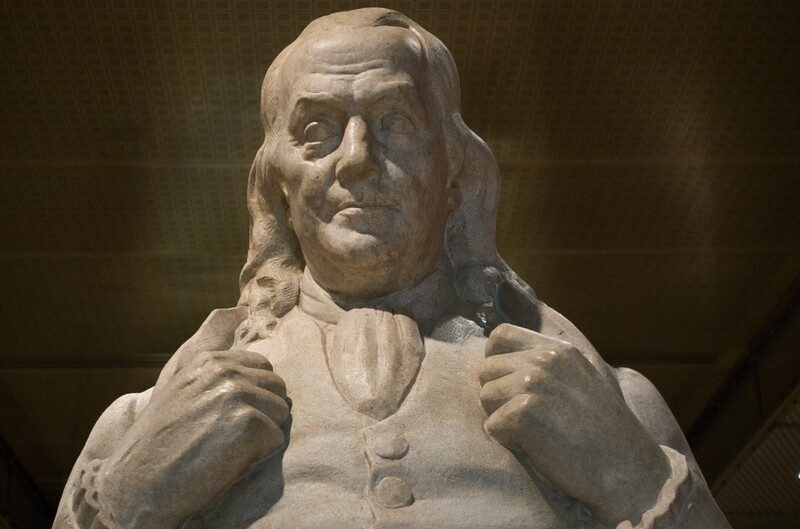 If you're an American, perhaps you've heard that none other than founding father and prolific inventor Benjamin Franklin first came up with the idea. Sure, we Americans like to give ourselves a lot of credit. But this one is founded in Franklin's own writings. In 1784, while visiting Paris, he wrote An Economical Project to address the high costs of candlelight. It seemed ridiculous to Franklin that Parisians woke at noon in the summer hours, wasting several hours of daylight. He offered a remedy: "Every morning as soon as the sun shall rise, church bells and, if necessary, cannon shall inform the citizenry of the advent of light and awaken the sluggards effectually and make them open their eyes to see their true interests." Thankfully his cannon-blasting alarm clock idea did not take off. It was Englishman William Willett over a hundred years later who came up with the idea of changing clock time to keep up with the delayed sunrise in summer. In 1907, he published his brochure, "The Waste of Daylight," in which he advocated the U.K. to move its clocks forward 80 minutes between April and October. Though Parliament considered his proposal, it put off any action. Unfortunately, Willett died in 1915 before any laws were passed. Gradually, countries passed laws to change clock time to maximize sunlit hours. In the United States, however, the adoption was sluggish and left to the decision of individual cities. In 1963, Pentagon officials were two hours late to a military meeting in Alaska because they were unsure of the local time on the Russian border. In 1965, about half of the major American cities (those with populations over 100,000) did not observe DST, according to National Geographic. Clearly, the situation was getting ridiculous. Finally, Congress made DST official with the Uniform Time Act, signed by then-President Lyndon B. Johnson in 1966. Of course, it is not entirely uniform. Alaska and Hawaii do not change their clocks, nor do the U.S. territories or all of the Native American nations. Not everyone is grateful to these creators of DST. There is actually an active lobby to end the clock change, if you want to join them. Or, if you're one of those lazy people like me who would rather just roll our eyes at Daylight Saving Time, watch it get mocked on Last Week Tonight With John Oliver.